This post is mostly going to be about other people besides myself. I mean, how fun is it to have a blog and just get to talk about me me me all the time? It's fun, but there are a lot of other very cool people and things out there, so it won't kill me to talk about someone else for once, no? But first, a tiny bit about me me me, or actually, my lunch. I made an arugula salad with sun-dried tomatoes, mushrooms and Parmesan cheese, zucchini & tofu stir-fry and there were a couple prosciutto-wrapped asparagus left from dinner last night, so I threw them in on top of the zucchini. Tasty! This website cracks me up, especially the pirate chickens and the chickens in their weekly meetings. My brother is playing in San Diego on December 2 at USD, I'm so excited. This is one of my favorite songs from his latest CD. Speaking of my brother, how cute is my niece? Super cute is how cute! She's a long boarder. When she saw the condors at the zoo she thought they were the most beautiful birds ever. Awww. While they are here I hope we'll have time to go to the San Diego zoo, I think she will love it. The next day we are having a big party at my friend Naz's house. Naz makes stunning art jewelry. Visit her site and her etsy shop and tell her hello. It would make her day! I've mentioned before that my parents are in China for a year. I think it's really fascinating to read about their experiences there. Blogs are so great for this kind of thing, aren't they? Now if they would just post some pictures. Speaking of blogs, I've been reading way too many lately. There are so many good ones out there! I need to make the time to re-do my links lists, which I just got all fed up with one day and deleted. I'll just mention a few right now. Moonstitches has some really beautiful fabric and embroidery projects to share. Look at these bags! I love them. When I joined a pet swap a few months ago Tracy was the my recipient. She even has a dog named Lucy. And now she has a blog of her own. She always has lovely photos, like these from her walk today. And among all the cool things she makes, are these terrific dog collars. Bear is getting his very own, lucky dog! 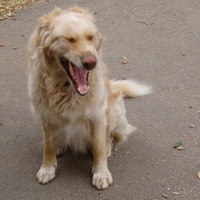 He was yawning. I guess I woke him up too early. I think my post office hates me. No sign of an embroidery kit yet. Once it took 5 days for me to get a Netflix movie, which was sent from Santa Ana. I think sometimes they hang out in the back at the post office, and when they get tired of stuffing the mail in our little boxes, or the clock says "5:00" they just quit. So, I'll have to talk about other things. I have some bento box catching up to do. Yesterday's lunch was not pretty. In fact, it looks kind of gross, but it was very delicious. It's Beef Bourginan, a thick slice of bread, cherries and a little banana. Yes, I did buy baby bananas just because they are so cute and fit nicely in my lunchbox. My Beef Bourginan was a little tempermental. I decided it would really be better to eat hot, and, not wanting to risk throwing my bento box in the microwave I put it on a paper plate to heat it up. It exploded all over the microwave, so I had to clean up that mess. It got much runnier after I heated it up, and as I was carrying it back to my desk I dribbled it all over myself. It was still good, though. Just a little dangerous. These are going to be lettuce bundles with grilled, shredded chicken, noodles with peanut sauce, scallions, carrots and peanuts. I thought I had a cucumber, but alas, there was no cucumber to be found in the vegetable drawer. I have extra peanut sauce and some strawberries too. I've made it through a good bit of these the last few weeks, and several are actually part of our family book club. Yes, I am a little behind on mailing them on. Oops. I try to keep track of all the books I read in a little journal I have, but I often forget to jot them down in there, and then it disappears for awhile and I find it again and I try to catch up, but it doesn't always work. I'm trying this out, to see if I remember to enter them there. It has all kinds of nifty little features, like a 5-star rating system and a place to write reviews. I didn't realize that the reviews were made public, so I just wrote a few lines to remind myself what I liked and didn't like about the books I've added. My reviews seem kind of lame compared to the others, I mean, they're not really reviews at all. So don't read them, okay? I think you can see my books here. 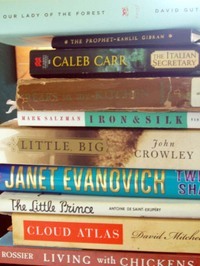 Anyway, I thought it would be fun to see other peoples bedside stacks, so spread the word, take a picture of your stack, and leave a link in the comments. Tell everyone you know! That doesn't sound dirty, does it? Show us your stack! When I fast-forward through commercials on my Tivo, I always hold my breath. Does anyone else do this? I have no idea why. I have to force myself to breathe when I hit that fast-forward button. Clafouti is really sort of like a big puffy pancake. In fact, some people were putting syrup on it. I had made it around breakfast time, so I guess that's okay. I took another one over to my semi-crazy aunt's barbeque, and we ate it cold. 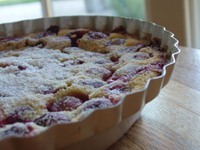 The consensus was that clafouti is best eaten hot out of the oven, but it's not bad cold. It was really easy, but I think there is way too much sugar in the recipe. It's really, really sweet. Also, Mr. Lucy, when he opened the refrigerator and saw it sitting there, was a little bit scared at first. He thought I'd brought home some sort of human organ. It is a little frightening, but I think the idea is good. I'm going to try it again with a lot less sugar, like maybe half the amount. Yum, Mexican food! Not very colorful, but very tasty! Black beans, rice with salsa, and whole wheat tortillas with grilled chicken, avocado and a little feta cheese inside. I brought a jar of salsa to eat with my burritos. I love salsa. This bento box is pretty big. It's about the size of a brick, and with this lunch inside, it weighed about as much too. Coming soon: little tiny cupcakes! I think it's about time to get back into the routine of things. My sabbatical went way too fast, and I had a lot of fun, and there were some assorted smaller tragedies, I was lazy some days, productive on other days. I didn't spend much time on the computer, except to play, so I have lots of blog catching up to do. I don't have much time today, so this is just a quick little fly-by to mention that I am still alive, and plan on posting regularly again. 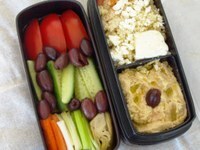 The picture above is yesterday's lunch: hummus, couscous and lots of assorted vegetables as well as feta and olives. I also had a couple mini pitas. That's my second bento box. It's actually quite large, that was really a lot of food, but I did eat it over the course of the day. So, hi! to everyone, thanks for still visiting even though there has been nothing but crickets chirping around here for the past 3 weeks. Isn't couscous a fun word to say? I don't necessarily want this to become nothing but a bento blog all of a sudden, so I made myself a flickr set for all my lunch pictures, so if you like to see what I make for lunch, check there regularly. I'll just post the very most delicious ones here. Besides, starting Monday, I am on Sabbatical for 3 whole weeks! So I won't be packing too many lunches, although I do have plans for beach days and park days and thrift store shopping days, so there may be a few opportunities to use my little lunch boxes. 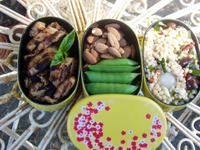 Today I made grilled chicken, sugar peas, almonds and Israeli couscous salad. My salad recipe is basically just to put my favorite things in there and mix it all up. I included fresh basil, sun-dried tomatos, kalamata olives, green onions and feta cheese and dressed it with a little olive oil and vinegar. Yum. Back to this whole sabbatical thing, after seven years, my company offers a 6-week sabbatical (in addition to regular vacation time) so I am taking half now. I'll be in Boise to visit family for a week, but the rest of the time I get to play at home! I want to plant a vegetable garden and do some spring cleaning and have a pajama day or two and be a tourist in my home town. I can't wait! It's all packed up and ready to go! I added another bowl for some mango slices. Want to see what's inside? Of course you do! UPDATE: Okay, my e-mail was actually working for about 5 minutes, my account was all straightened out, but now the service itself is down for everyone. So, I have a gmail account that I'll be using in the meantime, and I might just keep permanently. If you would like to send me and e-mail, use this address: heylucyloo(at)gmail(dot)com. I think I will change the link in the sidebar too, for now. 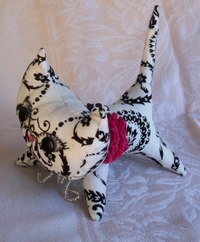 I finally took some (slightly) better pictures of the pointy kitty I made for Backtack III. She is finally on her way to Portland, and should arrive in her new home by tomorrow. I like the way the fabric worked out. I had my doubts, but with a little careful arranging, it's quite cute. I like her little pink embroidered nose, and I'm quite proud of her pretty collar with the knitted rose. It even has a loop and button closure, so it's removable. The 'M', I'm not totally pleased with, it's a little wonky, and my buttonhole stitching around her eyes, well, I've done better. I also think I should have cut the under body a little shorter, so she would have stood up a little taller. Oh well. I mostly like it, and I'm not too embarrassed to have sent her to her new home. 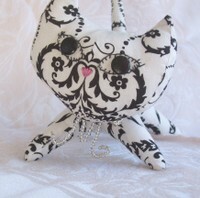 I received a very cute pointy kitty from Lori. I'll try to get some pictures taken this week so I can share, although you can see her on Lori's blog. When I first saw Hilary's pattern, I thought it was cute, but not something I needed to make, but I think I've changed my tune. I like the way it came out in the fabric I used, and I really like how it looks in the fabric Lori chose for me. I'll talk about it more when I have pictures to share. I've spent the last few days obsessing over Bento Boxes. I go out to lunch almost every day. For the most part, I think I make pretty healthy choices, but I know that if I made my own food, it would be much better for me and cheaper too! And I could control the quantity, and avoid that afternoon, "I'm so full, I'm never eating again" mantra that we chant nearly daily around here. I'm stopping by Mitsuwa tonight on my way home to get myself a bento box and I'm going to make myself lunch at least 3 days a week. I actually started today, even though I had to use ugly disposable plastic containers for my food. I made Japanese noodles (I don't know what kind they were specifically, the package just said "Japanese-Style Noodles") with spicy peanut vinaigrette from Trader Joe's. I added shredded chicken, green onion and a sprinkling of sesame seeds and topped it with some shredded lettuce. I tossed it all together before I ate it. I also made a cucumber-radish salad with rice vinegar dressing and some cantaloupe melon balls. Delicious! Although I am pretty full. Cooking Cute makes some very tasty looking lunches for herself and her husband. And it sounds like she has a Trader Joe's nearby too. 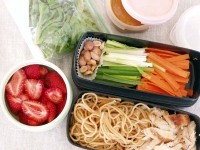 Lots of good ideas here and some really great links to all sorts of bento resources. This is from June 9, I love that green bouquet on the rice. And that's not even the most elaborate one. 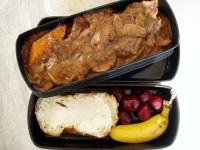 This is a nice little introductory site about bentos. I'm watching a couple boxes on EBay. This one is pretty. I think this one is really elegant, and this one is just cute. 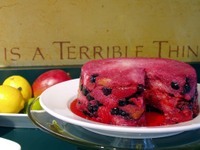 This post at Recipezaar is informative, and has links to some recipes that look really delicious. 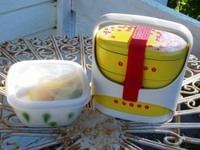 PBS has a nice feature about a mother who makes a bento for her child each day. 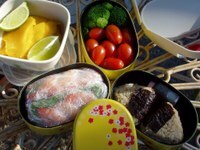 Live-journal has a bento community, and there is a Flickr group too. 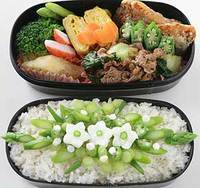 For a more modern version, you could go with Mr. Bento although $44.29 is a little pricey. I'm sure long term it would be worth it. 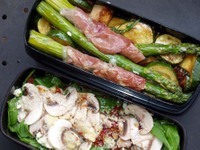 Stay tuned for more Bento mania!